Two genuinely useful complications for the business traveller. Despite what you may see on Instagram and Facebook, there are still plenty of watch connoisseurs who enjoy wearing a more traditionally styled watch. 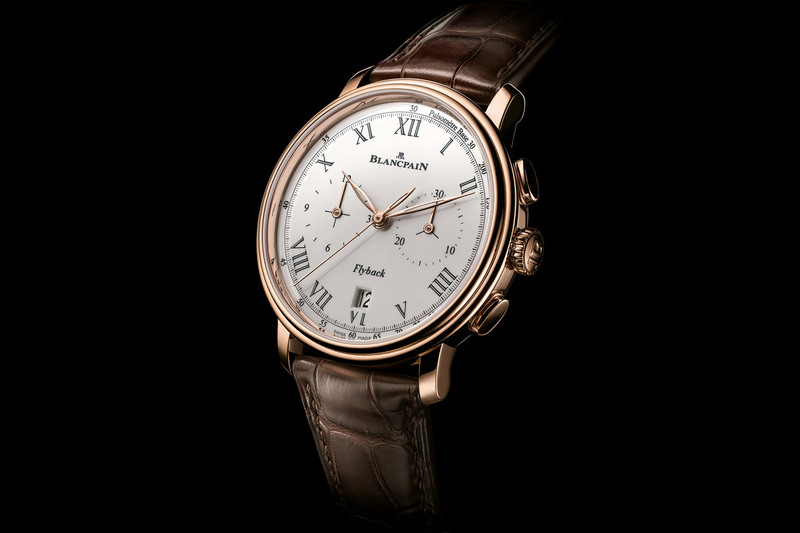 Something like the sophisticated yet practical Blancpain Villeret Quantieme Complet GMT. Introduced earlier in the year, this new model epitomises the classic aesthetic Blancpain is well known for, bringing together two genuinely useful complications in the form of the complete calendar and the GMT function. An ideal choice for the business traveller, we recently spent some time getting to know this latest version better. 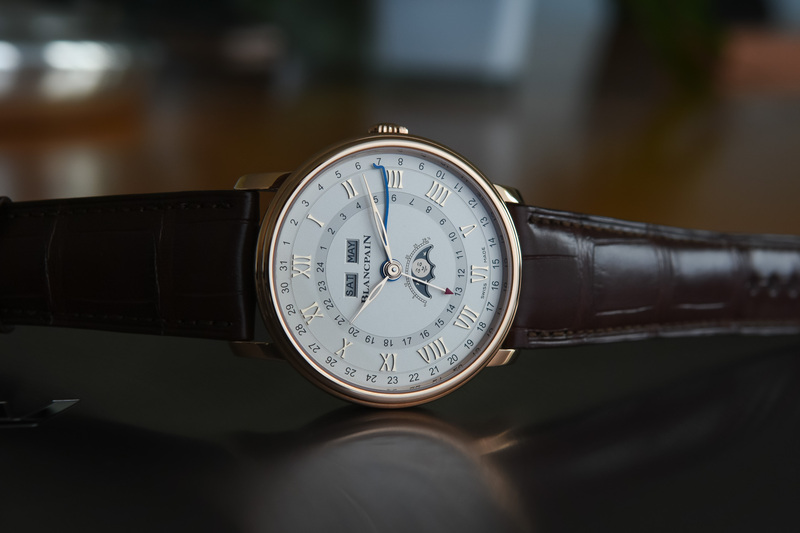 The Villeret Quantieme Complet is not a new watch as such. 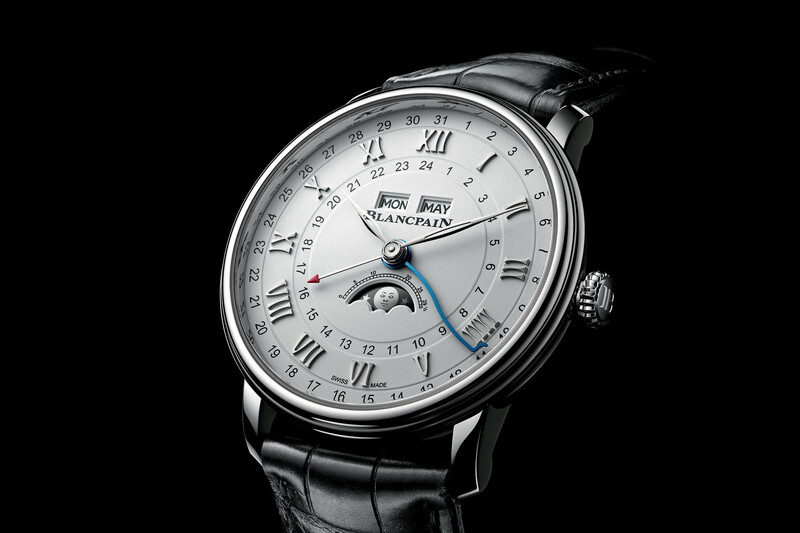 In fact, it’s been in the Blancpain collection for over 15 years, following its debut in 2002. Such longevity can be attributed to its refined style and practical functionality. The story goes back even further than that, however, to the early 1980’s. 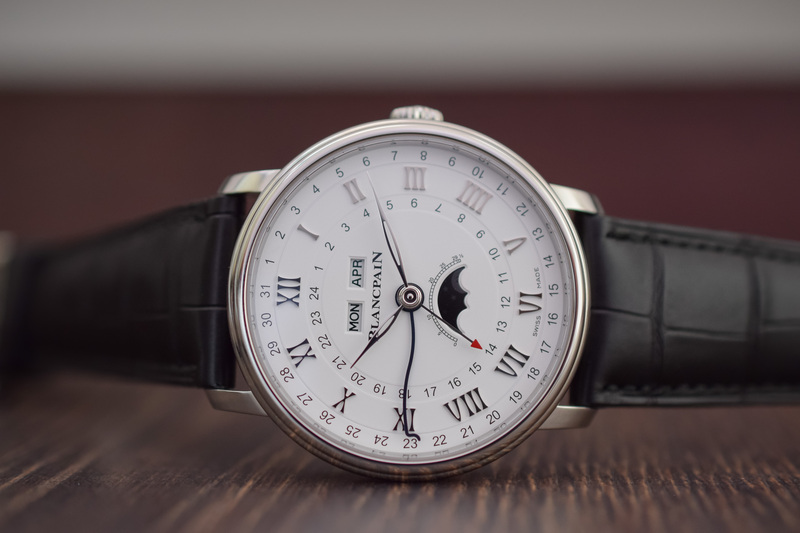 It was during this period that Blancpain was re-establishing itself and complete calendar moon phase timepieces quickly became (and still are) a signature of the brand. 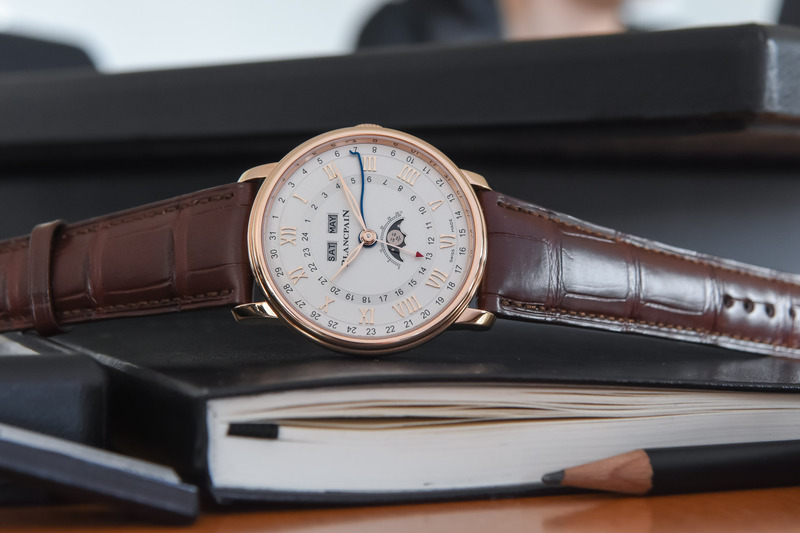 This latest version sees the introduction of an additional complication in the form of a second-time-zone, as well as the inclusion of Blancpain’s innovative under-lug correctors. Offered in your choice of steel or red gold, the case of the Quantieme Complet GMT measures a comfortable 40mm in diameter by 11.8mm thick. The case is well proportioned and sits comfortably on the wrist, pairing nicely with a shirt and tie. The steel version is definitely the more casual of the two, although it’s still very much a formal watch. It’s also surprisingly well priced, all things considered, but more on that later. 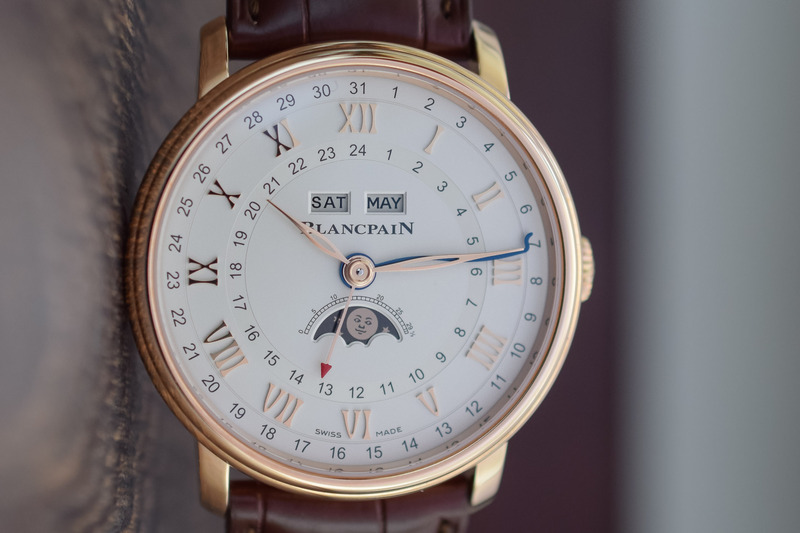 Quite a bit of information is on display on the dial but Blancpain does a good job of keeping things balanced and not too busy. The time is shown centrally, with hours and minutes only. There is no running second, which makes sense given that there are an additional two central hands for the date and GMT respectively. 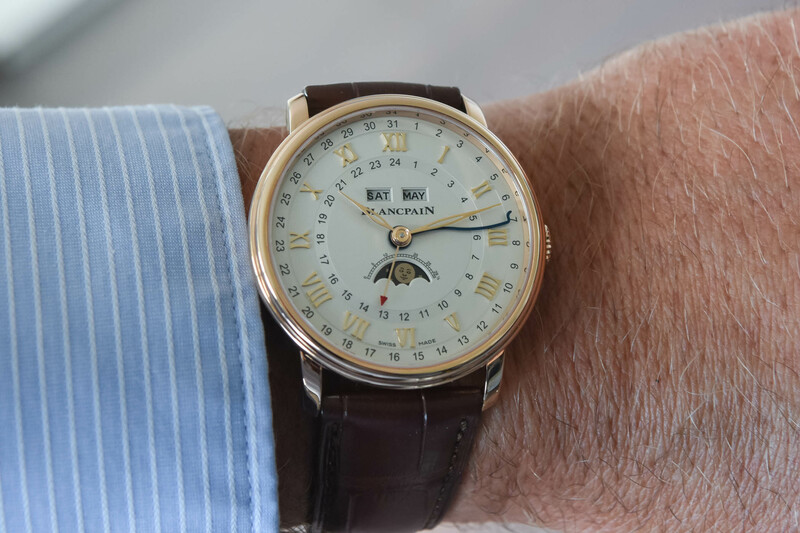 The day and month are shown via double apertures that appear below the 12 o’clock position, close to the dial centre – a classical display for a complete calendar, often seen on 1940s/1950s watches. This is balanced by the moon phase display showing through a crescent aperture in the mirror position, on the lower half of the dial. A blued serpentine hand (to distinguish it from the time hands) points to the date, shown on a chapter ring spanning the dial’s outer circumference. A second hand with a red-tipped arrow points to the inner 24-hour chapter. This display is used to keep track of home time, while the main hour hand can be jumped forward and backwards in one-hour increments, via the crown, for easy adjustment to local time when travelling. The calendar indications are linked to the local time display, making it useful for travellers who regularly find themselves crossing time zones. 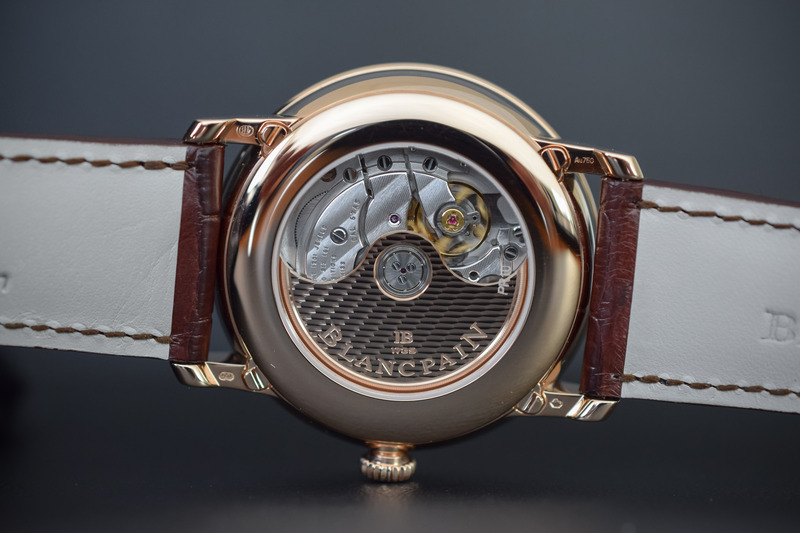 To ensure easy reading, the dial (white in the steel version, and opaline for the 18k red gold) is divided into several layers that clearly define the track of each ring of numbers. 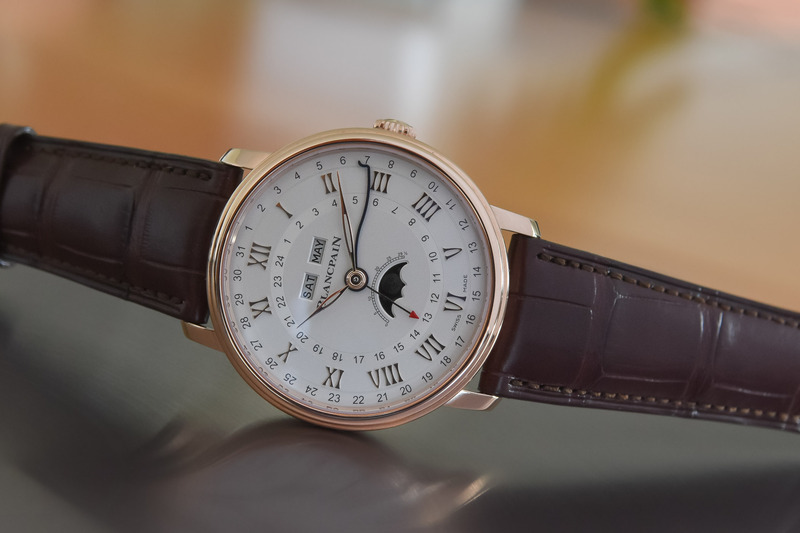 Large applied Roman numerals in red or white gold in Blancpain’s signature font are used for the hour indices, adding to the model’s formal appeal. Framing all this is a classic Villeret double-stepped bezel. Clean and easy to read, it’s easy to overlook just how much information is simultaneously on display here. The overall execution of the case, dial, hands and habillage is, as expected from Blancpain, discreet but perfectly assembled. What really makes this an easy-to-live-with watch, however, is the inclusion of Blancpain’s exclusive under-lug correctors. This non-intrusive innovation allows you to easily set all of the calendar and moon phase indications with your fingertip, instead of using the standard tool. This is particularly useful if you travel a lot and don’t want the hassle of bringing along the tiny corrector tool. Hidden away discreetly, the correctors also offer the added aesthetic benefit of completely smooth case flanks, absent of the corrector dimples we’re so used to seeing. Inside is Blancpain’s in-house 67A5 calibre, which now features a silicon balance spring. The self-winding movement is set with 28 jewels and stores a power reserve of 72 hours. 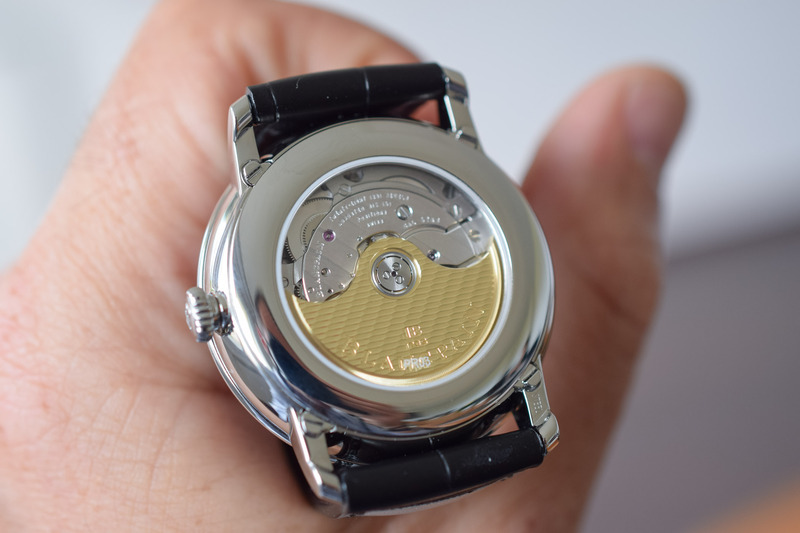 On display through a sapphire caseback, the movement is nicely finished and boasts a decorated, solid gold rotor, Côtes de Genève on the bridges and polished bevels. 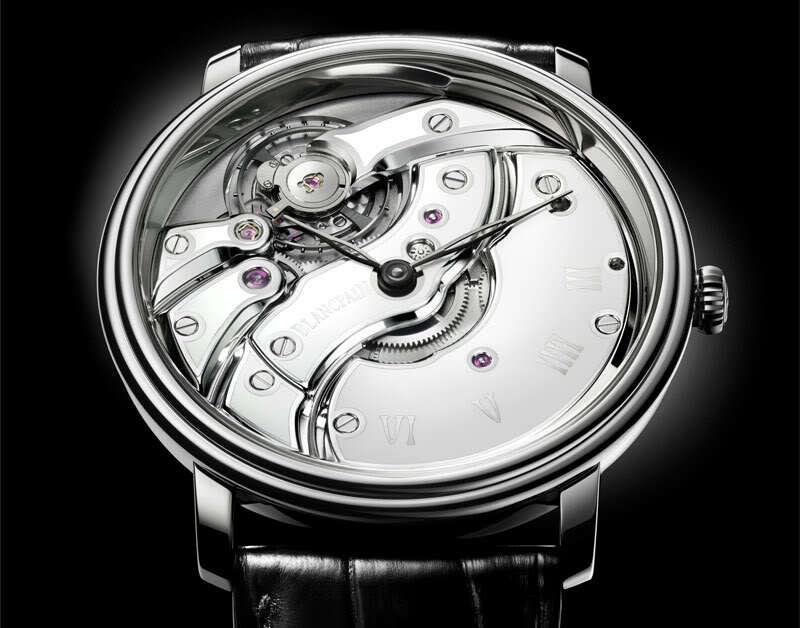 As I mentioned earlier, pricing, particularly in steel, is quite attractive, especially given the complexity of the watch and the prestige of the name behind it. Available now, the steel version (ref. 6676-1127-55B) retails for CHF 14,900, while the red gold version (ref. 6676-3642-55B) is priced at CHF 23,400. 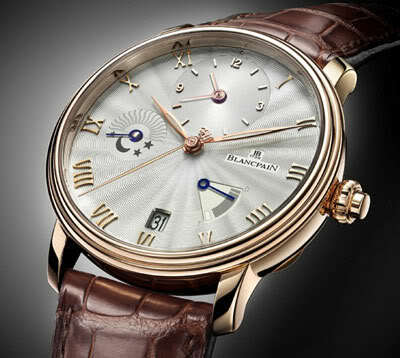 More details on www.blancpain.com. The price is OK, but this goes back to my problem with their annual calendar in steel. 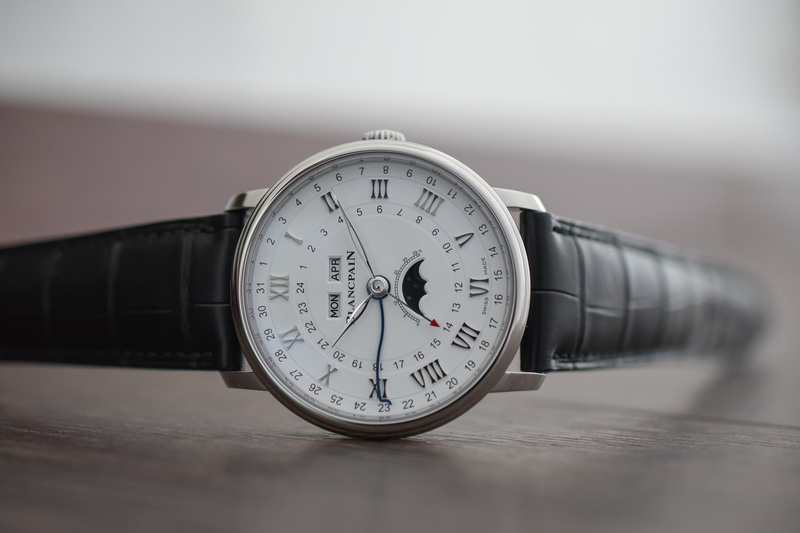 What’s the CHF price for this watch in Euros – about 13,500? 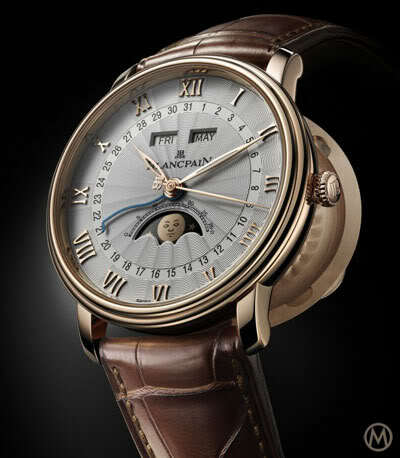 Their Villeret annual calendar gmt in steel is Euro 25,000. Try and figure that one out. I should add that I do like the way this watch looks. Most of their Villeret range are exceptionally beautiful. I have had my eye on this watch and its siblings for a number of years. The steel version is lovely, and would only be slightly improved with it being available in 38. 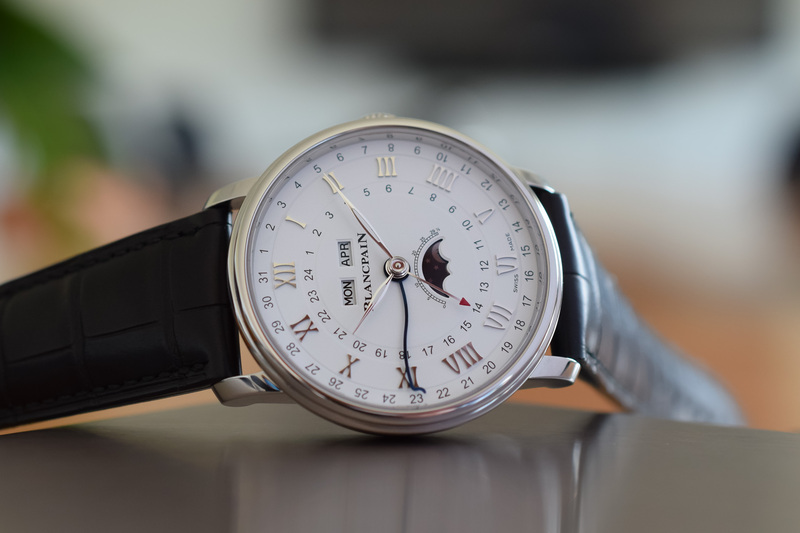 The adjusters and second time zone set this piece apart from the rest in the triple date with moonphase category. Based on internet searches, the Roman numeral 4 is IV (5-1), not IIII (1+1+1+1). That’s correct, Neil, however many watch brands use IIII for number four. There are several theories about why these are still in use, instead of the more recent way to write four as IV. I was told the watchmaker’s 4 was that way to allow the outer dial to be separated neatly into thirds: a set of four numbers containing ‘V’, a set of four containing ‘X’, and a set of four with just ‘I’s.